At present, in cable industry, Fire Retardant, Low Smoke Halogen Free (LSOH) OR Low Smoke Fume (LSF), Fire Resistant cables are all described as Fire Retardant & Resistant Cables. IEC60332-1, IEC60332-2 & IEC60332-3. IEC 60332-1 and IEC 60332-2 are used to assess the flame propagation characteristics of a single wire. IEC 60332-3 is used to assess the flame propagation characteristics of bundled cables. Comparatively speaking, IEC 60332-3 for bundled cables is more demanding than IEC60332-1 for single wires. This test details a method of test for the assessment of the flame propagation characteristics of a single wire or cable. In this test, a 60cm cable sample is fixed vertically inside a metallic box and a 175mm long flame is applied at 45C from a gas burner placed at 450mm from the top at the upper portion. The specimen is deemed to have passed this test, of after burning has ceased, the charred or affected position does not reach within 50mm of the lower edge of the top clamp which is equivalent to 425mm above the point of flame application. The test method is not suitable for the testing of some small wires due to the melting of the conductors during the time of application of the flame. IEC60332-3C describes a method of type approval testing to define the ability of bunched cables to resist fire propagation. In this test, a cable specimen, consisting of number of 3.5m lengths of cables are fixed to a vertical ladder tray where they are applied with a flame from a gas burner for a specified times under controlled air flow. Four categories (A, B, C & D) are defined and distinguished by test duration and the volume of non metallic material of the sample under test. The cable specimen is deemed to have met the requirements of the standard if, after burning has ceased, the extent of charred or affected portion does not reach a height exceeding 2.5m above the bottom edge of the burner. Plenum rated cables meet the NFPA -262 standard (formerly known as UL910) which provides the most stringent requirement of all the tests. Cable samples on a horizontal tray in a tunnel type of chamber are burned at 87.9KW (300000 BTU/Hr) for 20 minutes. To qualify for a plenum rating, the cables must have the flame spread of less than 5 feet or 1.5 meters, with a smoke density during the test of (a) 0.5 peak; and 0.15 maximum averages. The CMP cable is usually installed in air ventilation duct and air return widely used in Canada and USA. The fire retardancy properties of CMP cable is much better than LSOH cable complying with IEC 60332-1 and IEC 60332-3. Riser rated cables meets UL 1666. 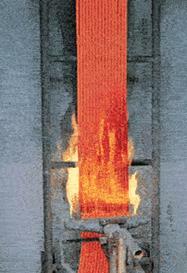 Cable samples on a vertical shaft are burned at 154.5KW (527500 BTU/Hr) for 30 minutes. To qualify for a riser rating, the cables must have the flame spread of less than 12 feet beyond the ignition point. This test does not look at the smoke density or toxicity. Riser cable is suitable for vertical shafts not defined as an environmental air plenum. General purpose cables meet UL 1581. Cable samples on a 8 feet vertical tray are burned at 20KW (70,000 BTU/Hr) for 20 minutes. The cable is deemed to pass the test if the flame spread will not extend to the upper portion and extinguish by itself. UL 1581 is similar to IEC 60332-3C, except for that the number of testing samples is different. This test does not look at the smoke density or toxicity. The CMG cables are usually used in runs penetrating single floor. This cable cannot be installed in vertical pathways. The restricted cable meets UL 1581, Limited-use. The test consists of 25 feet long ventilated tunnel. The cable is placed on a ladder inside the tunnel and the flame of 30,000 BTU/Hr is applied to the cable 15 seconds on and 15 seconds off five times for a total exposure to the flame of 1 minute and 15 seconds. To quality for this test, after the test flame is removed, the cable can flame for not more than 60 seconds and the charred portion will not exceed by 25%. UL 1581, VW-1 is similar to IEC 60332-1, except for the difference in the time for flame applied. This test does not look at the smoke density or toxicity. The CMG cable is suitable for use in. dwellings and for use in raceway. This cable cannot be installed in bundles and must be protected in metal conduit. This type of cable is the minimum requirement in commercial installations. Fire resistant cables are designed for maintaining circuit integrity during a fire. Both the IEC and the BEC adopted two different standards, namely the IEC 60331 and BS 6387. Comparatively speaking, the fire performance requirement for BS 6387 is more demanding. A cable sample is placed over a gas burner and connected to an electrical supply at it’s rated voltage. Fire is applied for a period of 3 hours. The temperature on the cable is between 750℃ & 800℃. After 3 hours, the fire and the power is switched off. 12 hours later, the cable sample is reenergized and must maintain its circuit integrity. BS 6387 specifies the performance requirements for cables required to maintain circuit integrity under fire conditions. It details the following methods to categorize the cables according to cable withstand capacities. flame at 650C for 15 minutes while passing a current at its rated voltage and then the spray is turned on to give exposure to both fire and water for a further 15 minutes. A single survival category W is defined if the cables surpassed the testing requirement. Resistance to fire with mechanical shock – the final requirement is mechanical shock damage. A fresh sample is mounted on a backing panel in an S bend and is exposed flames while the backing panel is stuck with a steel bar with same diameter as the cable under test every 30 seconds for 15 minutes. The cables will be tested under the following temperatures: X (650 ℃), Y (750 ℃) and Z (950 ℃).